Defined by Mr Breakfast, maple is the distinct flavor of concentrated sap from Sugar Maple trees. 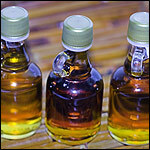 In Colonian times, native indians taught American settlers how to tap the sap from maple trees. Boiling the sap to evaporate excess liquid results in maple syrup. In a broader sense, Maple refers to shade trees, of the genus Acer in the Order Sapindales, variously classified in a family of their own Aceraceae, or (together with the Hippocastanaceae) in Sapindaceae. It's also a kind of wood that makes a hell of a desk. 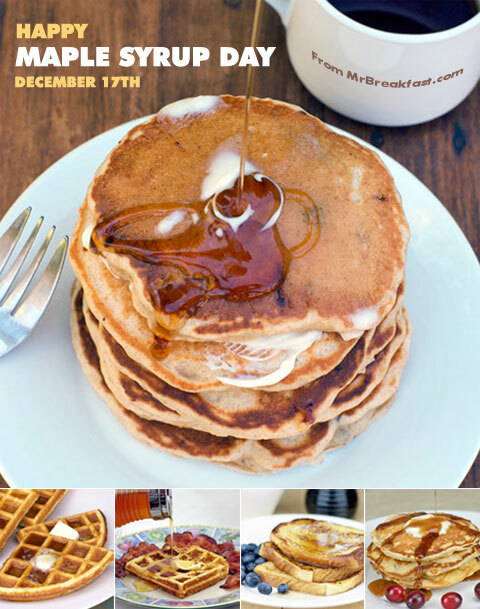 December 17th is the most commonly recognized date dedicated to appreciation of pure maple syrup. Communities and farms that produce maple syrup have scattered the calendar with their own Maple Syrup Days - some of the more common are December 18, March 3, July 22 and July 23. In truth, every day is a good day to appreciate maple syrup. "Great Breakfasts" Start With The Letter "M"